As a city that never sleeps and the kaleidoscopic capital of Japan, Tokyo’s energy is electrifying during both the day and night. A magnificent mixture of temples, anime shops and towering skyscrapers, the city is home to plenty of cocktail spots too. These establishments offer creative and colorful concoctions for visitors to enjoy under the bright lights. So whether you’re seeking a minty mojito or a tangy martini, here’s the best cocktail joints in Tokyo to visit when the sun goes down and the neons light up. Stepping inside Kamiya Bar is like stepping back in time to a soviet-era establishment. The furnishings here are simple and plain, the tables are designed in blocks and are paired with comfy black seating, and the exterior mirrors the tall, unadorned buildings typical of Russia. This is the best spot in the city to try a unique liquor made on the premises called denki bran, an extremely potent concoction consisting mainly of a herby brandy. This place attracts a mixed crowd of both travellers and locals looking to try the authentic Japanese beverage. Albatross is set in the heart of Shinjuku, in a small walkway by the tracks on the west side. This walkway is brimming with vibrant bars and restaurants, and it is here where Albatross serves a variety of sake, shochu and beer options. A two-storey bar with a trendy ambience, try to secure a seat around the counter to kick back with a cocktail or two, one of the many varieties of sake, or perhaps a pint of ice-cold Heineken. Shot Bar Zoetrope is dark and cozy, an exclusive alcove typical of many bars found dotted around Tokyo. This is the place to come to try an amazing selection of over 300 fine Japanese whiskies, as well as a choice of Kentucky bourbon, English whiskey, blended Irish whiskey and more. Old black and white movies are shown here, and whiskey ads from the 1950s adorn the walls, two features which add to the laid-back, nostalgic atmosphere of the place. The establishment can only accommodate 12 to 15 people, so make sure you get here early. Located on 28th floor of hotel Conrad Tokyo, Twenty Eight offers excellent service and brilliant views over Tokyo Bay. A warm and welcoming spot, a huge rustic fireplace and comfortable seats set the scene for a relaxing drink in a homely setting here. Whisky and wine options abound, and if you’re seeking something non-alcoholic, there is a very impressive collection of teas here which includes aromatic flavors such as chai and cinnamon. 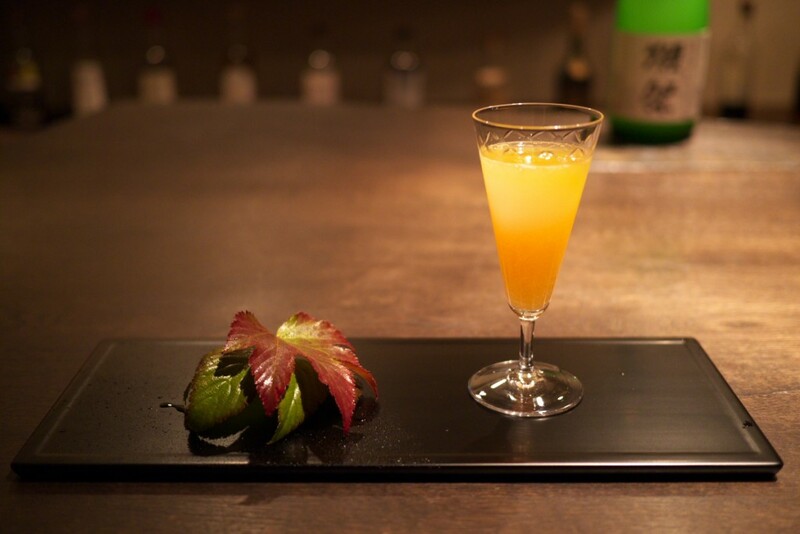 Their signature cocktail, the Tei-en, is a perfect mixture of vodka, cucumber, shiso, kiwi and cardamom seeds, and is definitely worth trying. Gen Yamamoto is a bar made from the trunk of one tree. Every drink here is presented in a different piece of colorful glassware like it is a piece of art, and the owner, Gen, is always around to happily dispense advice on the different cocktails and spirits on offer. Top cocktail picks here include the ginger and rosemary blend, the strawberry and basil flower drink and the matcha, mandarin and cucumber variety. Hidden away in a small office building, Ishino Hana Bar is a little bit hard to find, but is truly a hidden gem in Tokyo. A spot which takes its cocktails seriously, expert bartenders using first-class ingredients and the latest mixing equipment rustle up some delightful concoctions. Don’t miss the green tea option made with fresh tea leaves, vodka, lime and soda water. The interior is narrow and dimly lit, creating a romantic setting for an intimate evening of drinks and conversation. Ben Fiddich is another cozy and exclusive joint which can accommodate about 15 people at a time. Candles light up the room here and create a warm, dreamlike setting in which to enjoy a variety of wines, beers and cocktails. The staff here are charmingly dressed in smart suits, and the jars of spices and fruit which line the walls here are alluring and aromatic. Try to secure a prime seat at the bar where you can watch the owner, Hiroyasu, work his cocktail magic. One of Tokyo’s glittering sky-high hotel bars, Sky Lounge Stellar Garden is situated high enough to offer panoramic views, but low enough to keep customers within the buzz of the city below. The Tokyo Tower cocktail is a must try as well as the yuzu martini, and there is also a wide selection of ice-cold beer and high-quality Japanese whiskey available. And if you’re feeling peckish there is a full snack menu available offering an array of delightful Asian delicacies. This bar is operated by well-dressed bartenders in suspenders and bow ties, and is a place which, instead of offering a drinks list, encourages customers to order absolutely any kind of cocktail they feel like. The bar is sophisticated and features sleek and chic tables and walls, and there is tasteful neon lighting found dotted about the establishment. If you can’t quite think of what drink you would like, some of the house specials include the Manhattan cocktail and the Japanese grape and brandy blend. Two Rooms is a Tokyo cocktail spot which offers a Western-style dining experience as well as some colorful and refreshing beverage options. Choose from a variety of different settings here including a sophisticated indoor section, a lively bar and a spacious terrace, top spots in which diners can recline with a fruity and delicious strawberry bellini. The frogs legs and lamb chops here accompany drinks well.